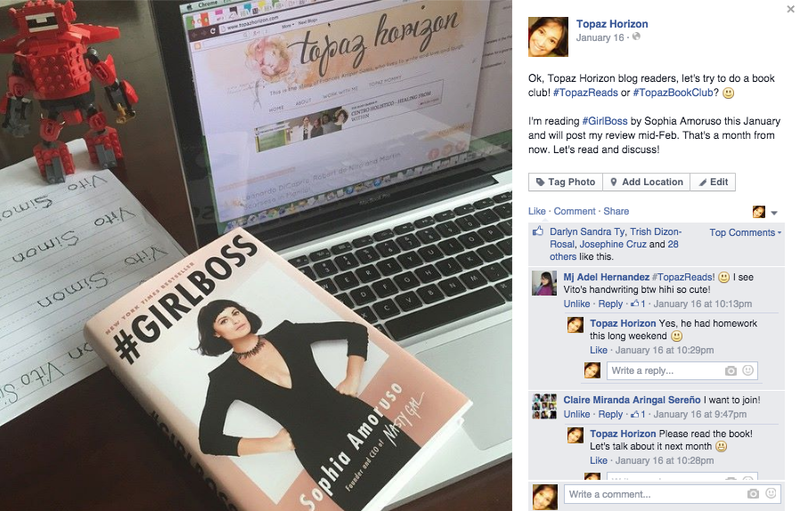 TOPAZ HORIZON: Topaz Reads: Discussing #GirlBoss on Feb 16! When I suggested a book club over at my Facebook page and Instagram, I got enthusiastic support from a few readers. Like, maybe three readers haha but that's okay! I figured it's easier to discuss a book with a few people than say a hundred, right, so here it is! 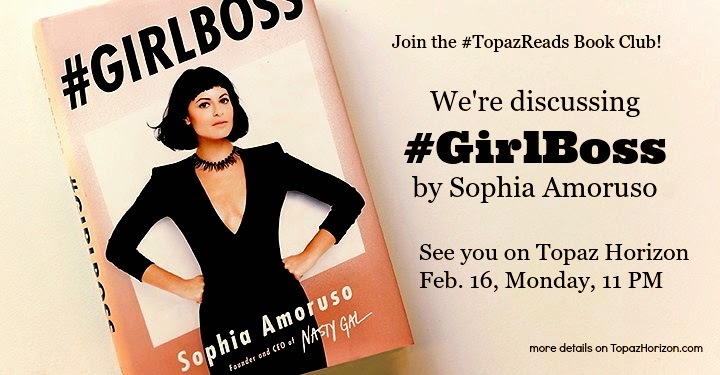 I'm officially announcing the first ever book for the #TopazReads book club: #GirlBoss by Sophia Amoruso. I'm in the middle of it now and I won't spoil my review but I will tell you a bit about the book. #GirlBoss is the autobiography of Sophia Amoruso, so, yeah, it's a non-fiction book. Sophia is the CEO of Nasty Gal, a multi-million dollar clothing company that started on eBay selling stolen goods. Wait. What? Yes, she was a thief and that's why I wanted to read it—I wanted to know how someone who used to be a crook reformed herself and got rewarded by millions of dollars! I like that the straight-and-narrow road has financial rewards. The book came out last year and enjoyed success because—and this is my opinion—there were books like Lean In and celebrities like Emma Watson and social media movements like #YesAllWomen. I am all for feminism and raising awareness on women empowerment so I was happy to choose a book that puts "girl" and "boss" in its title. I just hope it's a good book! So anyway! That's all I'll say now. 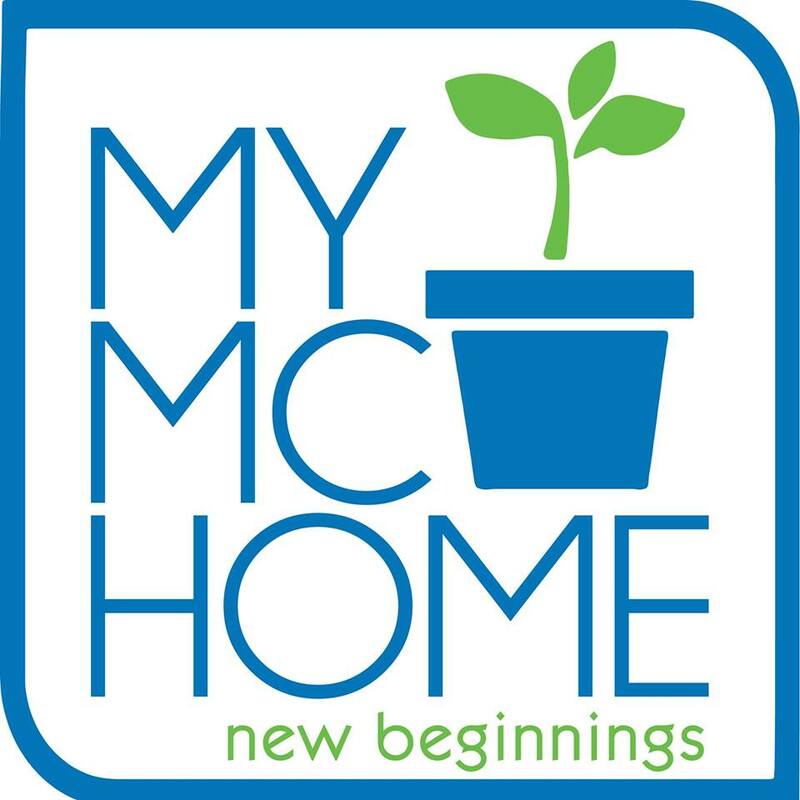 The book review will be published here on Feb. 16, Monday. Then I'll be online at 11 PM to chat with you live. Well, if any of you are still awake at that time! Sorry, readers, I'm a mama and I can only work late at night! My guess is no one will chat with me haha. 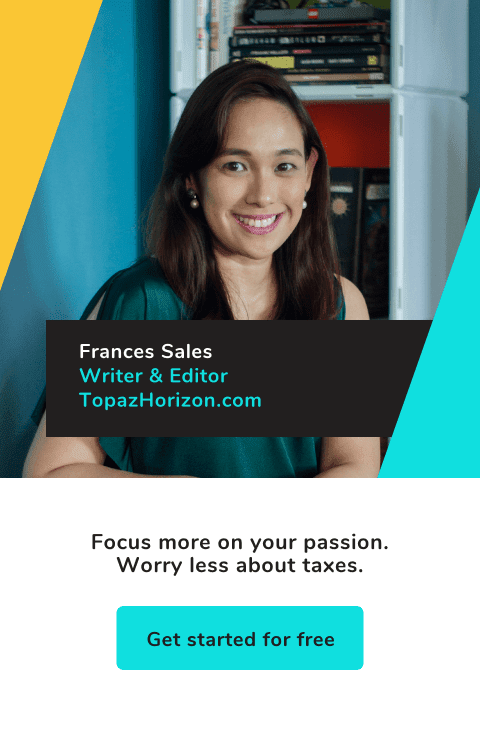 To participate in the live chat, just visit TopazHorizon.com on Feb. 16, Monday, read my review, then leave your questions/reactions/agreements/disagreements on the comments section. At 11pm (+8 GMT), I will go live and reply to every comment that I publish. If you're online at the same time, we can have a real chat! The chat will last just 30 minutes because it's already rather late in the night, but I think it will be fun! So please pencil the date in your calendars and see you back here on Monday, Feb. 16, for the very first #TopazReads edition! #GirlBoss by Sophia Amoruso is available at Fully Booked.